It wasn’t quite Leicester winning the Premier League in terms of fans wanting to see someone other than their own come home in front, writes Tony Keenan. But Awtaad’s 2,000 Guineas win for Kevin Prendergast was one of those rare racing moments when punters were happy to see their bet beaten: the veteran trainer is about as likeable and well-respected a person as there is in the Irish flat game. Prior to Sunday, Adrian Keatley was best known for winning moderate races at Ayr - exploiting my long held belief that a bad Irish flat horse is [slightly, but materially] better than a bad English one - and was gaining a reputation for placing his runners well in races they could win. Indeed, his record at Ayr is impressive, winning 12 times from 31 runners before Monday for a strike rate of 38.7% and a level stakes profit of nearly 47 points, admirable figures considering he has only 27 career wins to his name. In this approach, he is mirroring Gordon Elliott over jumps who targets his lesser horses at lower grade UK races; indeed, Keatley is on record as saying that he modelled his methods on Elliott. But the pair have more in common than that as the best context for Jet Setting’s win in the 1,000 Guineas on Sunday is Silver Birch’s Grand National win of 2007. Not only did both horses begin their careers in other yards, but both were sent out by trainers wildly inexperienced in campaigning runners at that sort of level. And while Keatley’s case is not quite as marked as Elliott’s (he famously hadn’t even trained a winner in Ireland before Silver Birch), he had zero practice in training a Group 1 horse before Jet Setting. In his career, he had saddled only a single runner at Group level and four at Listed class while his best horses – Athas An Bhean, Anonymous Lady and Manny Owens – were rated no higher than 89. Jet Setting was a triumph on every level: for the bloodstock agents who bought her so cheaply; for the connections who gambled not once but twice in supplementing her into a Group class; and, obviously, for the trainer who had her ready to beat Minding, already a three-time Group 1 winner and regarded as the best filly of her generation. Group 1 races at a mile are ultra-competitive and they tend not to be won by anything other than major trainers, whereas big sprints like the Nunthorpe and Abbaye have presented the opportunity for smaller owners to get in on the act but not the events over further. Nor is Keatley happy to rest on his laurels with Jet Setting as he already has a couple of North American races in mind for her. As yet, his backers tend to be a mix of minor owners and syndicates so it will be interesting to see if he can generate more support as a result of this. His immediate concern may however be G Force, who runs in the same colours as Jet Setting for the Equine Growth Partners Syndicate. Improving a horse out of the Hannon yard is one thing, David O’Meara quite another! It was perhaps lost in the buzz surrounding Prendergast and Keatley but Michael O’Callaghan had a pretty good Guineas weekend, too, sending out the third place finisher in both classics, albeit at a respectful distance to the winners. The important thing about Blue De Vega and Now Or Never is the colours they run in, those of Qatar Racing, and the young trainer has done very well to get such a major ownership concern into the yard at this early stage, especially as they have juveniles in training at Crotanstown as well as the horses they bought into after showing early promise. Over the past days, the former champion has been the subject of a number of major profiles in the national media with O’Callaghan getting plenty of coverage in the process. Having Fallon on the ground at a stable has to be a plus but the chances are this ends in tears if the past is anything to judge it on; but by then everyone will know Michael O’Callaghan’s name. One area where O’Callaghan seems to have slightly altered his methods in 2016 is in bringing his runners along more slowly than in previous seasons. Both Blue De Vega and Now Or Never improved for their first outing of the year and that’s been a case across the string; judging by Racing Post Ratings, the average improvement from first to second run this term was 8.7 pounds. He’s training them for the long game and that makes sense; the last thing a trainer wants to be is another Paul Deegan, winning everything on Lincoln day and the three weeks afterwards when people are still focussing on the jumps and hardly being heard of for the rest of the year. While only training since 2012, O’Callaghan has already built a decent brand. However, there is a suspicion that his reputation outstrips his production at this point. That said, there is more to running a training business than simply having winners; Gigginstown might use performance-related criteria when divvying up their horses but not every owner does and O’Callaghan has done really well in getting some big names through the door. He doesn’t have the hype surrounding him as the others, perhaps because he’s been around for longer, but Willie McCreery is a trainer of substance and he landed a double on Guineas Saturday that included a Group 2 win for Devonshire. He started training in 2008 and since then his number of winners has risen steadily, breaking the twenty win barrier in each of the past three seasons. 2016 looks like it could be a career best campaign as he not only has 11 winners already on the board but he is also operating at a strike rate of 19%, markedly higher than a previous best of 12%. Devonshire is a filly and McCreery has done particularly well with fillies, Fiesolana the chief feather in his cap over the 2013 and 2014 seasons. Indeed, her campaigning was a thing of beauty, beginning on an Irish mark of 93, winning six times for the yard, culminating in a Matron Stakes victory. Billy Lee was on board Fiesolana for much of her Irish career and if McCreery is the most progressive flat trainer around, then Lee is the most improved rider. He garners very little attention with an accent almost as bad as my own (!!) but he has developed into an excellent jockey and one that can be trusted on the big day. As I covered in my Grading the Flat Trainers piece last autumn, McCreery had more premier handicap winners than anyone else in Ireland last year (four) and it wasn’t as if he lucked into a single well-handicapped horse that went on a sequence. Rather he won those races with four different horses (three of them fillies, perhaps not coincidentally) and he went close to landing another on Sunday with Champagne Or Water. These races are a proper test of a trainer as they are seriously competitive with an average of 14 runners last year. Some of the bigger owners have started to come on board with McCreery. Sheikh Mohammed had his first runner with the stable in 2013 before using the Godolphin moniker the following year and the returns have been good, the trainer/owner combo with a strike rate of 19%. And it’s not as if McCreery has been getting their absolute bluebloods: Raconteur, at 200,000 guineas, is the most expensive Godolphin horses he’s trained which, by their standards, is not an extravagant purchase. That may change now, especially in light of Devonshire’s win at the weekend, a win which should be viewed as a success for the trainer as much as for the filly. She was readied for a race when the clear form pick, Lucida, wasn’t ready and took full advantage. That’s the sort of training and placing you want on your side. You wait for the trigger moment and then the story unfolds. It did for me this morning at precisely 4.42 a.m. after 40 minutes’ musing, or rather agonising. Would I major on the 2016 Classic picture, projecting on from events at Newmarket last weekend and Chester and Ireland over the past few days? Any such concentration would have the Ballydoyle (and as time unravels, Piltown) operations at the centre. But I’ll come (briefly) to the US Army Ranger/ Port Douglas ruminations later in the piece and the implications of a second Group 1 Aidan O’Brien 1-2-3 with Minding, Ballydoyle and Alice Springs in the 1,000 Guineas after a similar outcome to last year’s Moyglare. It was reverting back to the latter race last September when the idea for this week’s offering took shape as that day Now Or Never had finished an unexpectedly-disappointing last of ten for highly-admired young trainer Michael O’Callaghan. 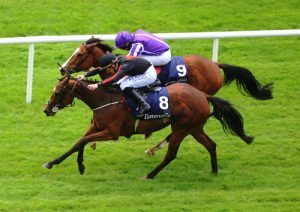 Yesterday at Leopardstown, filly and trainer made a huge leap into the consciousness of Irish racing with an emphatic success in the Derrinstown Stud Irish 1,000 Guineas Trial stakes, maybe helped by the absence of any of the leading Coolmore lights. But for me the main story was the identity of the jockey. On the same day that Mark Todd, 60, rode his own horse clear show jumping to clinch fourth in the Badminton Horse Trials, another equestrian veteran was in the winner’s enclosure at Leapardstown. Now 51, Kieren Fallon can never get away from the “Marmite” tag. You either love him or you hate him. Some of his time in Newmarket could be described as tempestuous with late (or even non-) arrivals at the track a commonplace. From the late 1990’s he occupied for a time three highly-coveted stable jobs. The appointment to the late Sir Henry Cecil stable in 1997 caused great comment at the time, when Henry initially described him as a “very hard worker”. It was during the Cecil years that I first got to know him quite well as I dovetailed my Daily Telegraph work with some advisory stuff for Prince Ahmed Salman’s Thoroughbred Corporation, who had several good horses at Warren Place. I’ll never forget the 1999 Derby won by Oath. In those days videos of races were relatively expensive and certainly a bind to get hold of from Racecourse Technical Services, so in the euphoria of success the Prince got me to ask the TV people if they would let him have a copy. Waiting in the booth next to the Epsom car park, I had a leisurely look at all angles of the race, and can still picture the head-on which showed just how beautifully-balanced Fallon kept his horse, with his own head a few inches to the outside of the horse to counteract the camber. Kieren rode 200 winners and more five times and collected six UK riding championships, yet the Cecil stint ended immediately after the King George in 1999 where Oath was unplaced. The atmosphere in the box was weird, hardly anyone showing up, much to the confusion of myself and racing manager Willie Carson, and headlines in the following morning’s News of the World, while probably inaccurate as far as Fallon was concerned, explained the forthcoming breach. In the early 2000’s Fallon was snapped up by Sir Michael Stoute, but after several owners expressed their misgivings about the jockey, the agreement lapsed. Still he later rode two Derby winners for Stoute, Kris Kin and North Light, but as a freelance. His UK Classic haul also features four Oaks wins, and five and four in the 2,000 and 1,000 Guineas. After Stoute and some more disciplinary issues, Fallon gravitated to his native land as stable jockey at Ballydoyle. While not proving such a lavish source in numerical terms, the 2005-7 seasons brought 57, 53 and 24 domestic wins, when Fallon was the regular jockey on Dylan Thomas, Holy Roman Emperor, Hurricane Run and George Washington among others. Fallon seemed preoccupied that day and no wonder as a long ban was imminent for further misdemeanours. He had been riding in Ireland during 2007 while under a UK ban and rode in neither country the following year. Back as freelance in the UK in 2010, Fallon rode 140 winners and followed with 154 the following season, riding for such as Luca Cumani, William Haggas, Brian Meehan and some of his old connections from his days in the north. Then it was 87, 62 and 62 again two years ago, before a virtual halt and some time spent in the US last year and over the past winter. One of the best bits of the Racing Post site, apart from all the stats, without which I’d never post an article, is the revelation of the lowest riding weight of the past 12 months. Fallon must have been getting one thing right in the States, as he is listed as having ridden at 8st1lb! In that case, at 51, you’d think he’d have descended into a wizened old man, but when I bumped into him at Chester last week I thought he looked the best he’d ever been, with a broad smile and fresh face. He duly went out and won on Ian Williams’ Sir Maximilian, much to the delight of the many people who’d cheered and on the odd occasion – like the controversial Top Cees Chester Cup – booed him past the post over the years. One thing I can say about Fallon is that when I’ve been around he’s never jumped off a horse and maligned him. Many top jockeys after a poor run would say to the owner: “He’s useless, get rid of him”, but Kieren always tries to look for a positive. After his latest US sabbatical, few would have expected him to pitch up in Ireland, but pitch up he did with O’Callaghan. 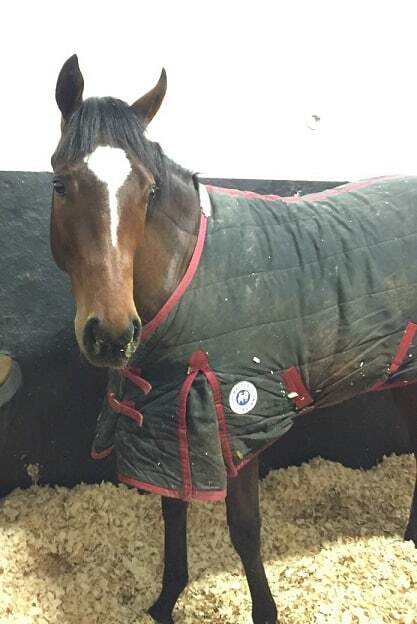 His first win for the trainer came with Approcailis at Dundalk last month and Now Or Never is their second together. So far he’s had 54 rides for four wins, while a few forays back over here have brought three more. O’Callaghan, interviewed recently, went up in my estimation when far from agreeing he’d done Fallon a favour, expressed his delight to have secured the services of such a brilliant rider. Yesterday at Leopardstown was Kieren’s first winner on that track since partnering O’Brien’s 1-2 shot Rectify to an easy win in the Derrinstown Stud Derby Trial five years ago to the day. Between 2011 and last year, that was his sole win from only five rides in his native land. Maybe Now Or Never can dent the supremacy of the Ballydoyle team and challenge for a place at least in the Irish 1,000 later in the month. I know most people were of the opinion that if Seamie Heffernan had sneezed in the latter stages of the Chester Vase, he would have retrieved the lead and victory from stablemate US Army Ranger. But he definitely gave the horse two decent cracks in the last furlong, to which the horse responded with a movement left and might have banged the eventual winner had he repeated the dose. At 20-1 Port Douglas looks the one for place betting with his uncomplicated running style and guaranteed stamina, but Aidan clearly believes there’s plenty of improvement to come from the other Galileo chap, so why should we doubt him? It's Easter, the clocks have gone forward and the nights are getting longer. And, on this second day of April, the first two year old races have already been and gone. Horses don't race before they're two, but how do such young animals develop from weanlings to the track? A lot of preparation - and a little luck - goes into getting a two year old to the racecourse. In this post, I'll explain how that happens, with some video clips of a juvenile I have (a tail and an ear of) in training with highly promising young handler, Michael O'Callaghan. First, a bit of background on both horse and trainer. Michael O'Callaghan is young - just 26 - and he's been around horses most of his life, having started his career as a breeze up consignor helping his dad. That means he's used to preparing young horses to look and behave professionally at a very young age. Much like himself in many ways, then; and perfect for taking on juveniles as a trainer and encouraging the best from them. In his first season, 2012, O'Callaghan sent out four winners from 32 runners. 2013 was a tad disappointing with just a pair of successes from 45 starters, but last year things stepped up a couple of gears. His 15% strike rate on 73 runners was worth eleven winners, including exciting types like Rapid Applause and Aggression as well as Guineas aspirant, Letters Of Note. The last two named have recently been acquired by Qatar Racing Ltd, which is a very exciting responsibility for O'Callaghan and his team as they move into the turf part of the 2015 season. It's a season in which they've hit the ground running with four winners from 18 runners already (22%), and plenty of promising young'uns to unleash as the spring progresses. Our boy is a son of Approve, the dual Group 2-winning two-year-old, out of a Red Ransom mare called Miss Red Ink. Miss Red Ink has already thrown a four-time winner from two foals to make it to the track. 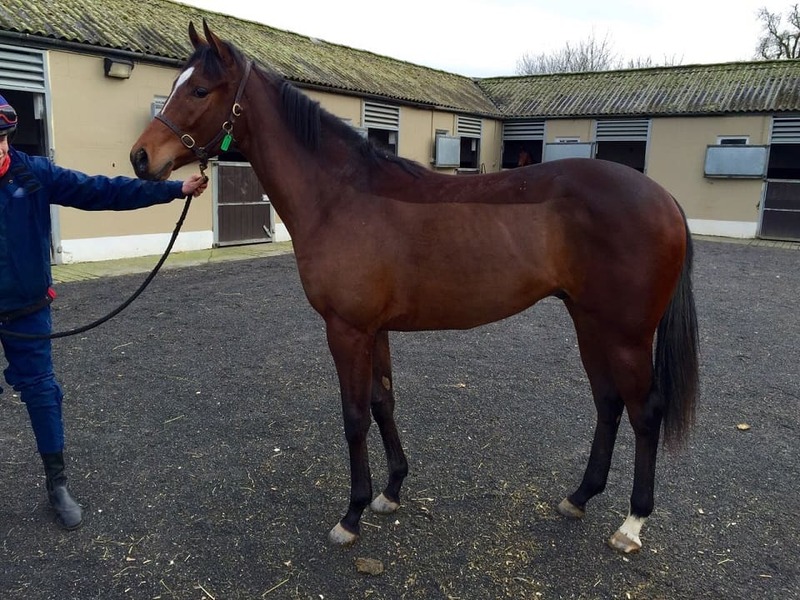 He was acquired in September last year at the Tattersalls Ireland Yearling Sales, having been born exactly two years before the Brocklesby gates opened last Saturday, March 28th 2013. Pre-sale notes: Well made, well balanced, W+ (Good Walker). Red Ransom (dam’s sire) quality coming through. Fast looking colt. Very fast family. Guide Value 20k. Stallion note: As a racehorse, Approve was a high class 2yo, over distances from 5f to 7f. A dual Group 2 winning 2yo, who won both The Norfolk and The Gimcrack Stakes, he is now an exciting young sire, with 24 individual winners in his first crop, including the exciting Listed winner, Accepted. Pedigree assessment: A sibling to three individual winners, this yearling has an exceptionally appealing pedigree, stacked full of high class stakes performers, including Champion 2yo, Winter Quarters, top sprinter Spirit Quartz and iconic performers such as Kingsclere, Passing Glance and Overbrook. The dam, Miss Red Ink is by a proven broodmare sire in Red Ransom and is herself out of a Mill Reef mare. And then it began, for us at least. As a young trainer, Michael is well in tune with the latest communication methods, and makes good use of them. He's set up 'whatsapp' (a free messaging application for mobile phones) groups to keep owners in the loop. And he's used it to great effect. The best thing about this approach - especially for someone like me, who lives far away from his Curragh training base - is that it enables him to send video snippets of our lad developing. Below is a short text and video diary from October last year to now, illustrating our boy's development. "Hi guys, this is yer colt with breaking tack on today. This is the start of him becoming a race horse: whether he wins a seller or a Group 1, it all starts here!" "This colt has proved very popular. I like him so much I am going to keep 2 shares myself. So if any of you have a friend ye think might want to get involved in him, act fast as there is only 1 share left up for grabs, and I don't think it will be available for much longer." "The colt is coming on well. He is almost ready for a rider now. Attached is a video of him long reigning: this is what teaches them to steer"
"This is the colt's first ever day riding. As you can see, he is great! It's a long way from the stereotypical breaking of horses we all know from the westerns." "Ye're colt is doing well, the usual snotty nose and girth rash the babies get this time of year. Other than that, he's great!" "Hi, I hope ye are all keeping well! I'm very happy with the colt, he has grown a good two inches since we bought him. He is a nice forward type." "He was up the Old Vic [gallop] this morning with the other 2yo's, they haven't done anything serious yet, but are coming along nicely"
"Approve near side first group"
"Four name suggestions gone in to HRI for colt are as follows Chasing Tomorrow, Brinkmanship, God Only Knows and Calrapid. They will decide which one he gets"
"The colt got the name, Chasing Tomorrow!" "I'm very happy with the colt. He was at Dundalk today for a racecourse gallop. Fingers crossed he might be running soon, I'll keep you all posted." "A date for the potential début of Chasing Tomorrow is Friday 17th April. The colt is going well, and I hope to start him off at Dundalk on this date". As you can see, the latest entry is the news this morning that Chasing Tomorrow might make his début in as little as two weeks. It's very exciting stuff, though of course who knows how he'll go?